Wooding, C. (2012). Pandemonium. New York, NY: Graphix. In Chris Wooding’s graphic novel debut, Pandemonium, he offers a devilishly entertaining, fun fantasy adventure, combined with slapstick humor, and unexpected plot twists. Teenage Seifer Tombchewer, a Skullball captain and heartthrob off most girls is kidnapped from his peasant mountain village, brought to the castle of the Darkling Realm kingdom, to impersonate the missing Prince Talon of the clan Pandemonium. While Seifer struggles to impersonate the missing prince, his actions and the reactions of those around him offer much comic relief to the reader. Inevitability, he proves to the royal family and royal advisors that his simple village ways and strong caring nature would make him a better candidate for the throne than the current Prince. Seifer mends broken relations with Talon’s younger sisters, Sarcoma and Min-Min and forges a close bond even after they learn his true identity. He also falls for the attractive fast flying and stunt performing Carcassa, who has come to ask her clan’s land back. Carcassa is the daughter of Baron Canasta Malefica, a gambling addict who won her in a card game. Siefer worries if anyone will remember him, his temporary fiancé Lady Asphyxia and her upcoming arrival that may ruin this entire ruse and result in him being fed to the “psycho carnage beasts” while also trying to avert a war with the Illuma, those who devised the kidnapping of Prince Talon and are working with Baron Crucifus who they have promised to give the throne to the Darkling Kingdom. 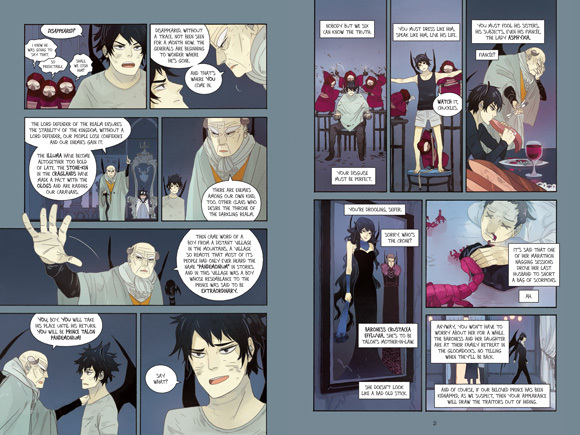 Basically, this is a modernized fantasy filled version of The Prince & The Pauper but still is absolutely entertaining. 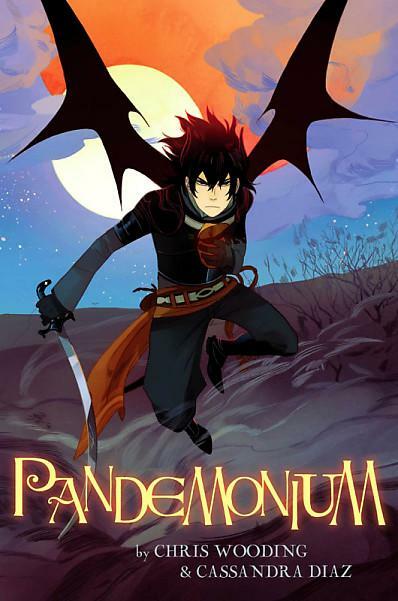 As Pandemonium ends with the words “The end…for now”, readers can assume that it’s likely to see a sequel sometime in the near future. Other graphic novels that may interest those that enjoyed Pandemonium with bizarre creatures, mistaken identities, self-sacrifice, all while trying to discovers one’s identity may also enjoy Ben Hatke’s Legends of Zita the Spacegirl, Akira Watanabe’s Fullmetal Alchemist manga series, or even Kazu Kibuishi’s Explorer: The Mystery Boxes.